The Prescot Bed has loads of storage. Includes: headboard, footboard, side rails, temperature control(s) and premium full depth 8" mattress for a complete flotation system. 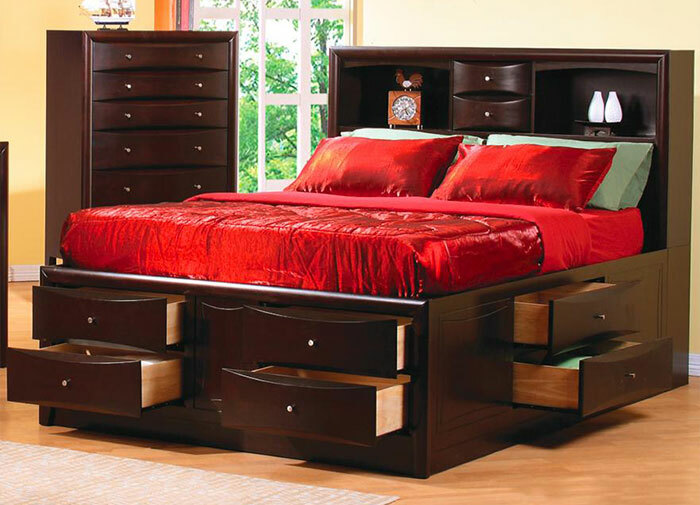 This Storage Bed hashas eight built-in storage drawers! 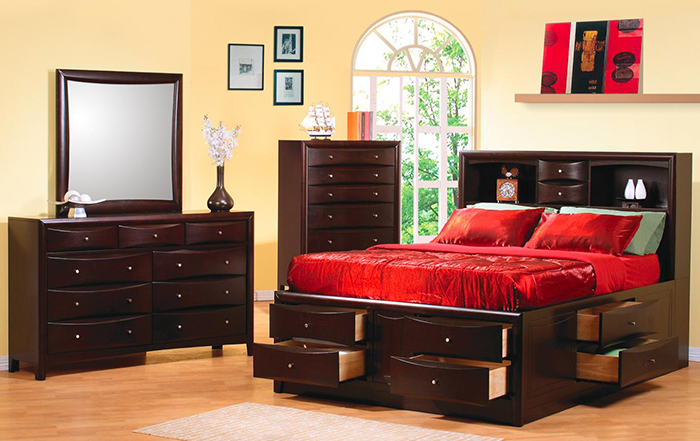 A High bookcase style headboard has two more small felt-lined drawers. Add Extra storage to your room without adding extra space. The Prescot Bed has two drawers below each side of the bed, and four drawers in the footboard. Crafted from solid wood with maple veneer, finished in cappuccino with brushed nickel finished knobs. Includes: Bed, 8" deep plush-top soft side mattress and temperature control(s) for a complete modern flotation system. Foundation not needed for this bed. Available in Queen, King and California King sizes. Temperature Control(s) included. Two with Dual Queen and King size mattress. Flotation Sleep Mattress - SAVE $100 off our regular price! This new style high quality 8" full depth luxury mattress has interchangeable and replaceable components. Our high quality flotation sleep system is flexible, comfortable and known for extremely soft and durable features. In addition, this flotation bed uses standard size sheets and bedding. Mattress Insert (Chamber) Your Choice: Waveless, Super Waveless, Premium Waveless or Ultra Waveless. Available in Single, Dual, and Tubes. Dual Chambers (left and right ) allows individual sleep comfort for each side. Dual Chambers Available in King and Queen size mattresses, are two chambers to allow each person individual control of their sleeping environment for the ultimate in comfort. DUAL systems come with two heaters, one for each of the water chambers. Tube Style If you prefer individual tubes instead of a single or dual chamber. Available in Free Flow or Waveless. Number of tubes: King 9, Queen 7, Full 6, Twin 4. Queen 63" W x 92.25"D x 56"H 60" x 80"
Eastern King 77.5" W x 92.5"D x 56"H 76" x 80"
California King 74.25" W x 96.5"D x 56"H 72" x 84"
Both options include a phone call from the trucking company to schedule a time and day with you. FREE Curbside Delivery: The delivery company that gets assigned to your order will call you and arrange a curb side delivery when it reaches a terminal in your area. Garage or Carport Delivery: The shipping company delivers your order to Garage or Carport.